Located in real space, these devices provide reference points in hyperspace to make navigation possible. How can you find your way through hyperspace, that featureless void outside of real space? You need beacons to show the way. The first ships to enter hyperspace had no place to go - and no way to tell if they had even moved. The beacons solved that problem and opened up the entire universe. They are built on planets and generate tremendous amounts of power. This power is turned into radiation that is punched through into hyperspace. Every beacon has a code signal as part of its radiation and represents a measurable point in hyperspace. Triangulation and quadrature works for navigation - only it follows its own rules. For a hyperspace jump, you need at least four beacons for an accurate fix. For long jumps, navigators use up to seven or eight. So every beacon is important and every one has to keep operating. That is where I and the other troubleshooters come in. From The Repairman, by Harry Harrison. What happens when one of them breaks down? You can't get to it directly through hyperspace; you can get close and then travel for months through real space. This is an early description of the hyperspace beacon concept. The same idea and term were used in the television show Babylon 5; without beacons, ships would drift endlessly through featureless hyperspace, unable to discern their location relative to real space. 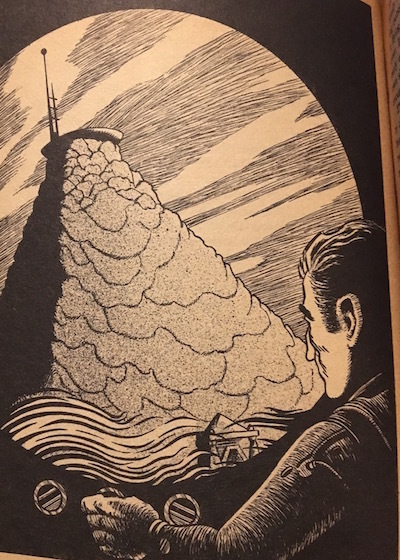 You'll find an earlier example in Troubled Star, a 1952 novel by George O. Smith: see space beacon. You'll find another version (not quite the same idea) in The Cosmic Blinker (1953) by Eando Binder; see Artificially Pulsating Star. - Is 'The Pulsar Positioning System' Evidence For SETI?